Amanda, over at Serenity Now, is having a Dish It! party. I've been writing my blog for what feels like forever, but I'm just now getting more and more involved in the blogging community (although I've been reading blogs forever in Google Reader, love that thing). Anyway, come check it out. For about five years, but I've really stepped it up (become obsessed?) over the last year or so. I wanted to have a place to write down stories about the kids and share with family and also a place to stick my projects. Over time, it's really grown into more about my craft projects, with occasional forays into my regular life. 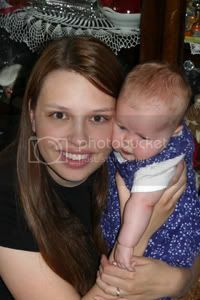 The first picture I ever posted on the blog, which is me with my niece Maddy. She just turned five and will be going to kindergarten next fall! Craziness! Tell me about your blog's title. Why did you choose it? Well, as a Utah Mormon, I feel it is my obligation to get creative with my substitute swear words. I was always saying craptastical, so when casting about for a new name for the blog to reflect more of the content, I it naturally came to be Craftastical. I love the idea of randomly exclaiming, "Hey, that's craftastical!" when I see awesome crafts, but you know, people wouldn't have any clue what I was talking about, so I only do it in my head. Plus, it's catchy, it expresses the content of the blog, it's short, and it's easy to remember (or at least, I hope it's easy to remember). I think I sort of covered that in a previous question, but I mostly do craft related content. I'm obsessed with trying all sorts of new crafts and teaching people what I've learned. I hope to inspire people with the confidence to try new things. I also do a digital scrapbook kit freebie nearly every week. I love the challenge of it and the motivation it gives me to finish things. It's my outlet, which I need. Raising a four children and going to school and church obligations and all of that can be really stressful, so this is my happy place. If you had to choose one famous person to become your blog's next devoted reader, who would you pick? Oh, that's a tough one. Maybe Anne Hathaway or Zooey Deschanel, both women I admire, who are outrageously talented, smart and funny. What's the funniest comment you've ever received on a blog post? I know I've laughed before, but I can't think of any off the top of my head. Hi! It was fun to read your answers! I love the name of your blog - it is great! Love the skirt and dress you just made! My 13 yr old won't let me sew for her anymore. Love your title, too. Hi! Here for the party! One question, Not sure where you're from yet in Utah but do you know anything about the Beehive Bizarre? I might be interested in flying up for it bc I have friends in Orem, but not sure if it's worth it. Please visit my blog sometime! Popping over form the Dishing It party... can't resist a great crafty blog! Off to browse some of your past projects! Visiting from Dishing It! Great blog.. I love your baby clothes quilt... awesome colors! Love how you came up with your blog name. I also love your header. Very cute! She really was just as chubby as I remember (LOVE that picture!). Love your blog, of course! It is getting more and more awesome every post.